X-MAN II toolset is developed by the Component-based Software Development group at the University of Manchester. X-MAN II toolset consists of the X-MAN IDE and its extension FX-MAN. The X-MAN IDE provides a set of functionalities for component-based software development. It supports the W process which captures both component and system life cycles. The extension FX-MAN provides the capability of modelling variability in order to support constructing product families. X-MAN II toolset is developed using Eclipse model-driven engineering. Essentially, it is EMF framework instantiated with meta-models of X-MAN component model and its extensions. Included plugins provide complete semantics of the X-MAN component model and component-based software development paradigm. X-MAN II tool development is supported by the European funded EMC2 project and the Centre for Doctoral Training (CDT) programme at the University of Manchester. This new tool will replace the old X-MAN tool (based on GME) here. The W model for component-based software development should be one in the below figure. The model was defined in our publication back in 2011. Component life cycle: identify components, construct components and build (domain specific) component repository. 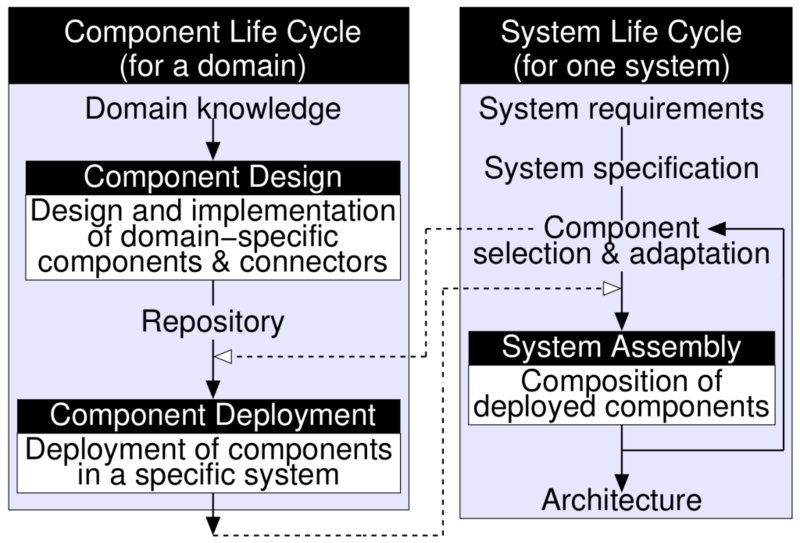 System life cycle: select components, instantiate (and adapt) components and construct systems. Components are encapsulated. They do not have functional dependencies among themselves. Simply put, they do not call each others. This is very different to objects. Components are coordinated by means of composition connectors which are control structures: sequencing, branching, gatingand looping. These control structures give Turing completeness and it is possible to construct any programs using them. Composition is algebraic and hierarchical and hence X-MAN is scalable. Once your licence request has been approved, you will be able to download a word document that contains a URL. The URL is an Eclipse software repository which must be used in Eclipse.